Just as our own skin protects our bodies from harsh elements that can compromise our health, the surface layer of a road protects the integrity of the layers beneath. That is why road surfaces are designed to receive periodic treatments to protect the integrity of the multiple layers of material. A surface treatment called “Chip Seal” or "Sealcoat" is KCRC’s most commonly used preventive maintenance treatments because it is a cost effective way to extend pavement life by an average 5-7 years. In the following video, Jerry Byrne, KCRC's Deputy Managing Director of Operations explains more. Chip Seal is a pavement surface treatment that combines a layer of asphalt with a layer of fine aggregate to provide a high friction-wearing surface over old pavement. Prior to chip sealing a road, road damage like potholes and cracks are repaired by KCRC crews. In addition, low hanging branches and overgrowth may be trimmed. An application of asphalt emulsion is then sprayed onto the road surface, which is then covered with pea-sized stone aggregate. Rollers follow to embed the crushed aggregate into the emulsion. After the Chip Seal cures (approximately 1-2 months), a Fog Seal will be applied. This application helps to significantly reduce tire noise, eliminate dust, and bind the remaining aggregate into a smooth, black, hard-wearing surface. What are the benefits to chip sealing? Chip Seal can extend pavement life by 5-7 years. It also increases the “friction factor” of the roadway surface, helping to reduce the number of wet and snow-related vehicle accidents. 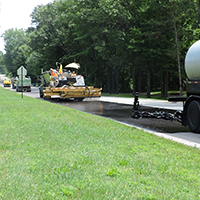 It is cost-effective, allowing KCRC to treat twice as many roads when compared to the next lowest-cost surface treatment. Chip seal application is typically applied from June to August because it requires warm, dry conditions. It is restricted by precipitation; inclement weather will delay application. After chip seal is successfully applied, a certain amount of aggregate will work loose during the curing process (approximately 1-2 months), and there can be dust post-application. What to Expect: The Chip Seal process is generally accomplished in one day, and intermittent lane closures are often used to allow drivers access. Post application, the new surface can be driven on almost immediately, but because of the emulsion and loose aggregate slow speeds are required. After the Chip Seal process, excess loose aggregate is swept off the roadway by mechanical sweepers. The roadway surface will continue to improve as the surface stabilizes, resulting in a stronger more durable surface. After the Chip Seal cures (approximately 1-2 months), a Fog Seal will be applied.